The tailed frog is a small amphibian of Canada they inhabit British Columbia, in the Fraser River Valley, in the south coastal mainland to the Flathead river in the south-east. Tailed frogs doesn’t grow more than 5 cm. Tailed frog have a rough textured ski ranging between olive green, brown and grey with white spots often matching the colours of rocks around the stream that they inhabit. 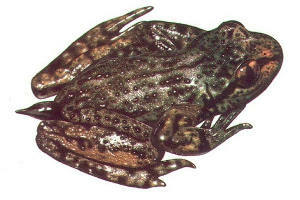 Tailed frogs have a translucent pink and a pale yellow/greenish triangle and dark streak that continues through the eye. They have a flat body similarly to toads. They are the most primitive amphibian of Canada and those primitive characteristics include Tailed frogs have reduced lungs and rely on their skin to absorb most of the oxygen the need. For this reason, they are usually living in well oxygenated waters. Also these characteristics include a vertical, diamond-shaped eye pupils and the lack of a tympanum (an external ear drum). Males have a tail like organ with a vent at its tip. During the breeding season, males also develop small, horny, black pads on their feet, arms and chest. Tailed frogs are a bit different than other frogs because of their inability to flip out their tongues. This unique phenomenon is due to the fact that their tongues are fixed to the back part of their mouths and give them a preference for terrestrial and aquatic insects that hide under rocks. They have a lot of predators including salamanders, fish, other frogs, snakes and small mammals. The breading season of tailed frogs from early summer to October and is also different from frogs because instead of external fertilization, tailed frogs use their “tails” for internal fertilization. The eggs are carried in until they are laid, which normally happens the next year. The tadpoles transform into adults in 2 or 3 years, but may not breed and reproduce before they have 7-8 years..